Yesterday we followed the river on the Columbia River Highway, today we are circling the mountain on the Mount Hood Scenic Byway, a 105 mile crescent-shaped route that begins where the Hood River meets the Columbia, just west of The Dalles, and ends just east of Portland. 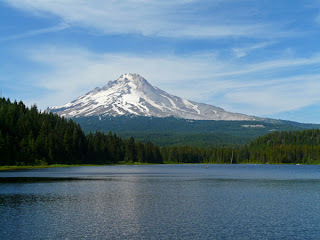 The snowy peak of Mount Hood, at 11, 245 feet, is visible from almost every stop we make along the highway. 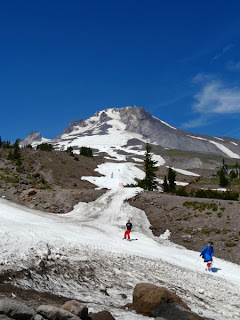 Consequently, we have well over 100 Mount Hood shots by the end of the day. The first leg of our journey takes us through the Fruit Loop, a fertile swath of the Hood River Valley that runs for about 30 miles, brimming with orchards, vinyards, berry patches, farms and farm stands. Not realizing the bounty that awaits us, we stop at the first stand we see to replenish our supply of local cherries. There we pick up a map of the local farm stands—there are 34! We manage to limit ourselves to just two other Fruit Loop stops. At Hood River Lavender Farm, we loll amid the fields of over 70 different varieties of organic lavender, and other mixed flower gardens. 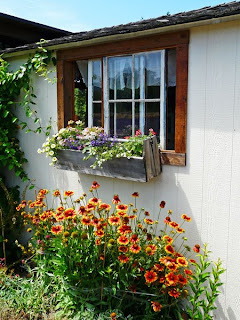 The fragrant gardens are in the peak of their bloom, and humming with bees. There are lots of chairs scattered about the grounds for lounging, a little garden shed is full of lavender products (including a pear jelly flavored with lavender with little spoons for sampling), and photo ops abound, including many shots of gardens in the foreground and Mount Hood in the background. We finally tear ourselves away, and drive down the road to the Draper Girls Country Farm, where we end up stopping right after two truckloads of forest service fire fighters unload. They are wearing tee shirts that identify them as the Zig Zag Hot Shots (Zig Zag is a town we will pass through along our scenic route later this afternoon). While chatting with a fire fighter woman in line ahead of me, I learn they are on their way home from a couple "man-made fires" in Washington. It hasn't been much of a fire season so far, but they keep busy doing other forest service work that uses their skills, such as clearing hazardous downed trees along forest service trails or doing controlled burns. They also spend a lot of time training. They all look incredibly fit, and terribly young. 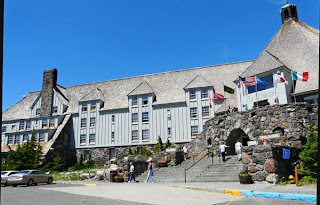 We add frozen apple and pear cider pints to our cooler, and dried cinnamon apples to our snack bin, and, after a brief picnic stop in Mount Hood National Forest, we are on our way to Timberline Lodge, the only four season ski resort in the lower 48 states. It is also our country's first government-owned lodge/resort, built as a WPA project, and dedicated by Franklin D. Roosevelt in 1937. We get there just in time for the 2 p.m. ranger tour of the lodge, where we learn more about the impressive craftsmanship that went into the making of this building. It had to be built strong to withstand 22 feet of snow piling up on it and drifting around it in winter. The design is ingenous, because it is strong, yet it has soaring spaces and lots of glass to provide great views of the mountain. But, the indoor views are spectacular, too. Everywhere we look, there are hand-crafted details—carved wood trim, decorative wrought iron, hand-hooked rugs, and fine stone work. A series of linoleum cut murals lines a large recreation room. Women got together to make curtains and quilts for the lodge guest rooms, which were all decorated differently in the lodge's earlier days. When we are done wandering around the ski lodge, we go outside to watch the skiers. The lifts have just stopped, and everyone is on their last run of the day, but it is a big mountain, so it will be quite some time before the slopes are empty. When we get to the parking lot, there are 20 busses from just one ski tour provider lined up in the lot to take clients down the mountain and back to town. We are ready for a little exercise ourselves, and the ranger recommends a path around Trillium Lake, which lies in the national forest not too far from the foot of the mountain. When we get to the parking area, we see two ambulances and several police cars across the lake. With my binoculars, I can see that a medic is performing chest compressions on an adult. There are a lot of people in bathing suits standing in shallow water or on shore, watching the action across the lake. Sobered, we walk the trail. Since it circumnavigates the lake, we frequently have a clear view across the water, where we can see the CPR continuing. We hear from some fishermen that the ambulances have been here over an hour. We do not hold out much hope. But, later, when we are deep in a wetland beyond the lake, we hear sirens departing, and decide that must be a good sign. We pass a little ampitheater on a point overlooking a quiet inlet filled with lily pads. It is roped off and reserved for a wedding. Later, as we are almost to the spot where the ambulances were parked, we can hear a big group singing "Happy Birthday," their voices carrying across the lake. We feel as if we have witnessed the full circle of life in our little walk around the lake.